Looking for a little help from any OAX owners that have ventured into the VST world. Roland (a WersiClubUSA member) sent us a question about configuring Auderio Revival Drawbars on OAX. We are about 50% of the way to getting it to work. We were able to load the VST, display it and even hear a default drawbar sound. However, controlling it (adjusting the drawbars, effects, etc.) from within OAX is proving to be a bit of a challenge. Anyone else in the group want to take a run at it and share what you learn with the rest of us? We have a couple more ideas and plan to fool around with it a little more this week. Bill – I downloaded “VSTHost” to virtual Windows PC I have and while I was able to load the VST – So far, not able to “play it”. As always, your expertise is welcome. Comments from all are more than WELCOME! I used to use VSTHost many years ago, however I now do it all from within my sequencer, which means I can move around windows as much as I like without problems. If you have a keyboard connected, pressing the Microsoft button will bring up the stat menu, and pressing ALT Tab will bring up all windows so you can choose what to view. Providing Windows is in Tablet mode, the Windows Keyboard (Not OAX keyboard) should pop up when required. Finally getting back to this and making a little progress. Turns out that if you swipe from the right side of the screen you can get to the Windows desktop and OAX does remain running in the background. There is an option to “exit” OAX which does exactly that, but not what we need. It does take you to the desktop, but as expected, it also exits OAX. Once that happens, no sound generated from the keyboards. 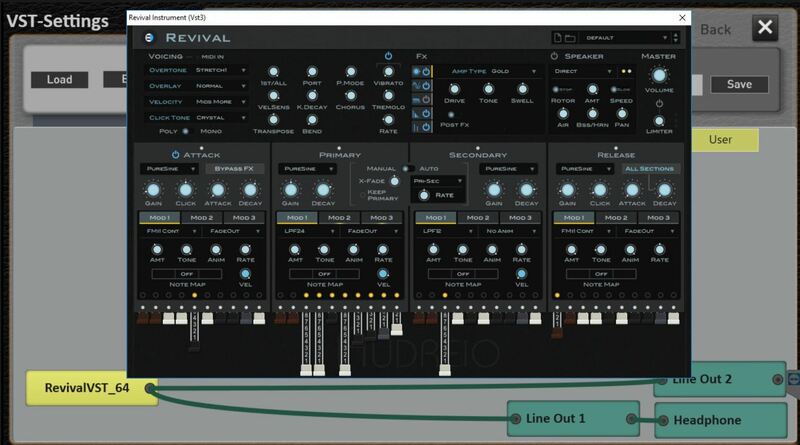 Now that we can “Window” between the desktop, the virtual keyboard, and OAX we are on to the next challenge of messing a little with the RevivalVST. The next challenge is keeping the VST window open so we can adjust settings while it is active. 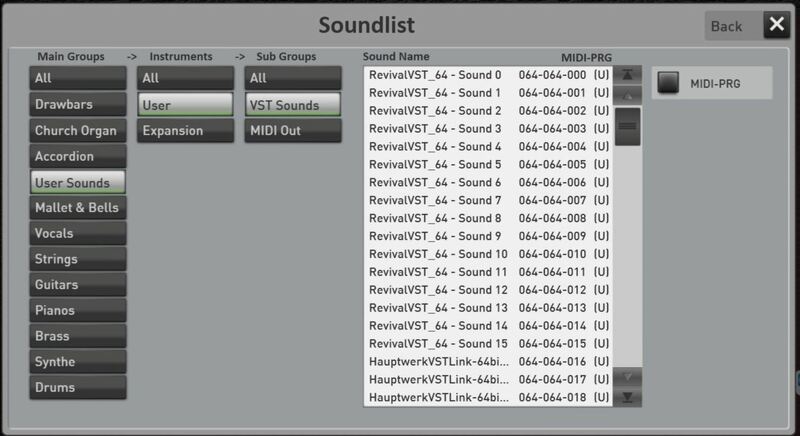 If anyone remembers, when you load the Hauptwerk VST you can activate it by holding down the “Church” button on the organ console. We basically need the same thing so we can really use the RevivalVST to change the drawbars. Just tried the demo version of the aforementioned VST, and it didn’t play in VST Host until I put an email address in the Revival VST box (A fictional one will be fine) and clicked Start Demo. Yea – I was able to get through that hurdle. The tricky part on OAX is the windowing system. One time I stumbled on a way to get to the Windows desktop and keep OAX up and running in another window. I need to figure that out again. One of those click on the left or right corner of the screen things. For example – I wasn’t able to bring up the virtual keyboard to type an e-mail address in while at the same time having the VST Host screen up in OAX. I got around that by using cut-n-paste. I exited OAX, went to Notepad, typed in an e-mail, copied it, re-launched OAX and the VST host and was able to past it in. And to do that I had to connect an external mouse so I could “right-click” and select paste. Any thoughts on a magic shortcut to minimize the OAX window so you would have access to other things while OAX is still up and running? I have not connected an external keyboard to see if that would help… Even if it did – FAR from a solution if you are actually playing the organ. It would only be useful for messy around – as I am. Out of interest – Are you using the VSTHost program or some other way to play around? Ah – The beauty of running on a VM. Just restored back to a checkpoint before I did the install of VSTHost and Auderio. Going to take a fresh run at it today. I tried to use the internal keyboard that is part of VSThost but obviously missed something in connecting it all up.